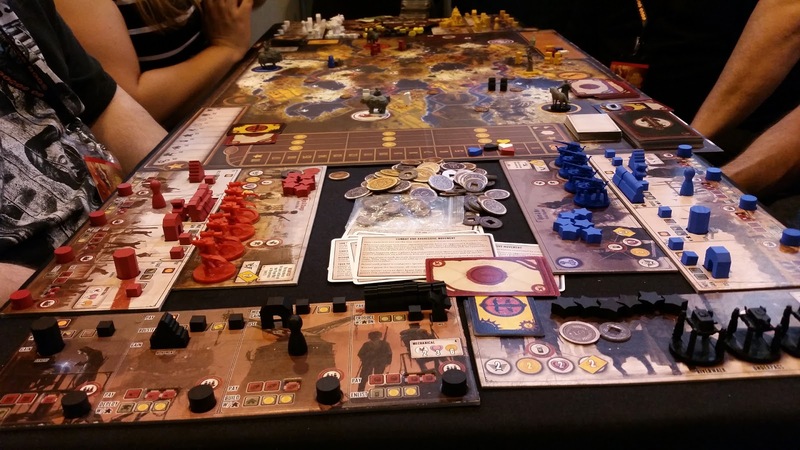 Given my slight bias for all things Stonemaier, it seemed only natural that I’d be angling for a run through of Scythe, the newest Kickstarter release from Jamey and the team at Stonemaier. It demoed at UK Games Expo this year and yours truly loitered around the stand like a 13 year old girl at the back door of a Justin Beiber concert, accompanied by perhaps only slightly elevated levels of screaming. 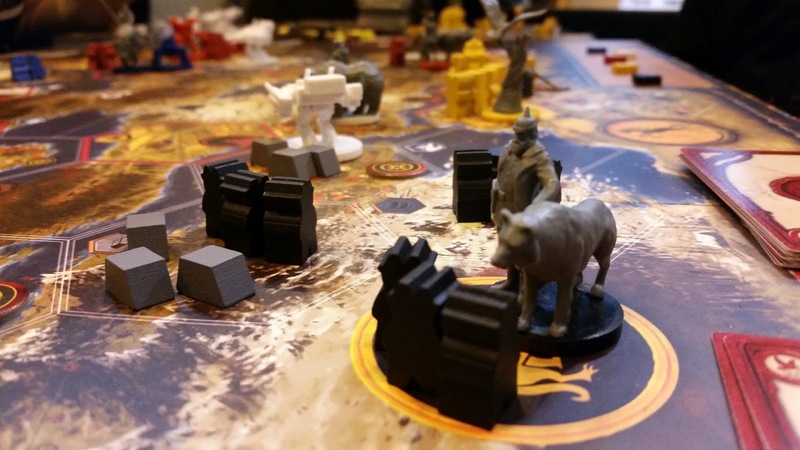 Sticking true to formula, Scythe presents itself very well indeed. The game is set in an alternate history where farming and giant Mechs (the most obvious of bedfellows) work together in building power for their fallen leader to take back control of the capitalist city state in which they reside. In addition to the general population of the faction, each player controls a character who possesses a unique ability – the Leader – who can be called upon to assist where required. Leader characters are denoted by miniatures, rather than meeples, to show their prominence. It’s a slight departure from Stonemaier’s previous offerings and it’s nice to see things being mixed up. The game area itself is comprised of a series of hexes, each representing a different type of terrain and therefore minable resource (e.g. Oil, Ore etc.) which can be exploited and used to purchase advantages, upgrades and, most impressively, Mechs. Players can move meeples (representing some population), their Leader or their Mechs from hex to hex, but only if they meet certain conditions. 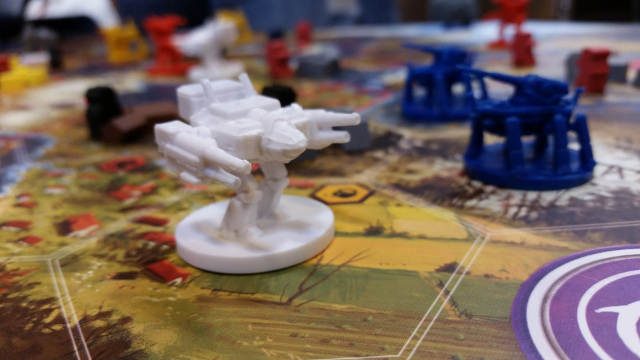 Meeples can’t move over water, but Mechs can. Mechs can carry things, but can’t mine resources and so on. There’s a lot to balance out and it works well. Players are given interactive boards that show their progress in the game and actions available to them. The main worker placement focus of the game is to designate which action the player wishes to perform that turn (you only get one!). Each player has the same type of action, but the costs, benefits and consequences of each action vary between players. In addition to that, players can change the costs of actions and improve the benefits through the game by using resources to purchase upgrades. Moving a benefit cube on a board to a cost space improves the benefit and reduces the cost. The boards are dual-level, a design element I really love. The result is that each player is in control of their own destiny as there’s not a die to be seen. The acquisition of Mechs allows players to expand their borders and take advantage of other resources and of course – to battle. Waging war is expensive, both in terms of resource, but also in the softer things in life – morals, morale and popularity. Will you play the likeable but meek leader who gets invaded often, or will you throw caution to the wind, ignore your populace and flatten everything in sight? 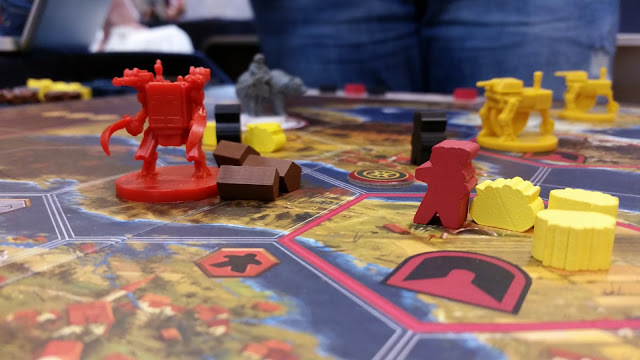 It’s your choice and I enjoyed this element of the game – even if I managed to amass an army of mining meeples, but no Mechs in my short playthrough. Clearly my Viticulture strategy wasn’t working for me here in Scythe-land. Making wine I’m good at – taking back a country, it seems, I need more practice at. It would be impossible for me to deal with every aspect of the game here in this First Impressions as there’s so much to Scythe that I’d be here until the day Satan opens up an ice cream stand in the 7th Circle. Needless to say, my first impressions are extremely positive. Scythe gripped me like a toddler clamps its mother’s leg when asked to get into the bath. It’s very beautiful, expansive and very deep. I’m disappointed in myself that I missed the Kickstarter, but rest assured, when this baby hits the shelves, I’ll be first in line.